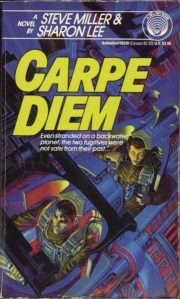 Sharon Lee and Steve Miller’s 1989 Carpe Diem is the third novel published in their long-running Liaden series. Set upon by the predatory Yxtrang, Val Con yos’Phelium makes a desperate bid to escape into faster-than-light drive. It’s successful in the sense that Val Con and his companion Miri Robertson escape horrific deaths at the hands of the Yxtrang. It’s unsuccessful in that their badly damaged ship ends up in the back of beyond, orbiting the interdicted world of Vandar. Briefly orbiting. A forced descent follows. 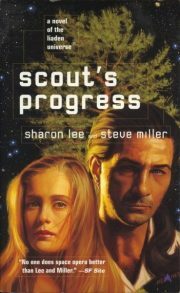 2001’s Scout’s Progress is the sixth book in Sharon Lee and Steve Miller’s Liaden science fiction adventure series. Aelliana Caylon has endured a short but miserable arranged marriage. Now single again, she is promised by her clan head, the Delm, that she will not be forced into another such marriage. Unfortunately, the Delm’s word is binding only while she remains in power. Her successor can ignore the promise. And it seems that Aelliana’s malevolent brother Ran Eld, will ensure this happens. The Liaden social structure is such that Aelliana has little hope of escape. But little is not none. Aelliana wields a weapon her corrupt, spiteful brother cannot match: applied mathematics! 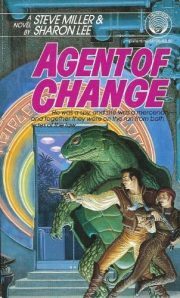 Agent of Change is the first volume of Steve Miller and Sharon Lee’s Liaden series. Terrans bitterly resent their lowly position in the galactic status hierarchy. The off-world humans are richer and look down on their hick cousins; aliens possess advanced technology that Terra cannot match. Off-worlders, human and alien alike, sneer at Terrans and violate their laws with impunity. As a result, Terrans tend to overreact to provocation. Terra is a dangerous place. Miri is an ex-mercenary. Val Con, of the clannish Liaden, is a spy. Neither should have come to Terra at this moment in time. Both of them did.